This Celtic Dragon Kite Shield is constructed from 1/2 inch plywood with 12 gauge steel boss and oak handle. 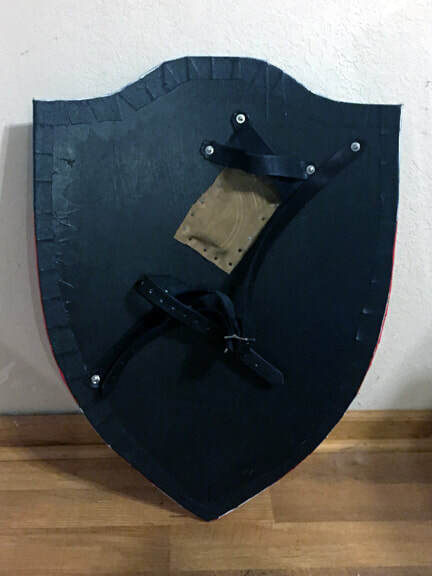 This shield also has an adjustable shoulder strap and it has an arm loop for the left arm. 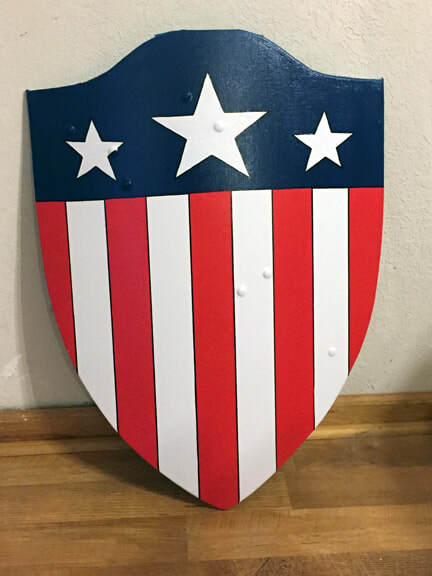 The shield is hand painted. The width of the shield is approximately 22 inches and 41 inches in length. Our curved America Shield is wrapped in canvas on front and painted black on the back. It has leather x pattern hand hold with suede leather covered hand pad; as well as adjustable arm strap. The arm strap and hand holds are attached by rivets. This product also includes a shoulder strap. The shield is hand painted. You may select left or right hand for handle placement. Our curved wankle Welsh shield blank is wrapped in canvas on front and painted black on the back. The image is hand painted. It has leather x pattern hand hold with suede leather covered hand pad; as well as adjustable arm strap. The arm strap and hand holds are attached by rivets. You may also elect left or right handed hand holds.